On the eve of the 50th anniversary of the 1967 referendum, in a sunset ceremony in central Australia, approximately 300 Aboriginal and Torres Strait Islander delegates from across Australia delivered the Uluru Statement from the Heart. 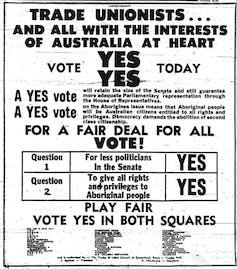 Convened by the Referendum Council, the statement put forth an Indigenous Australian position on proposed constitutional reform, rejecting constitutional recognition in favour of a treaty. Through the establishment of a Makarrata Commission (a body that would oversee agreement-making between governments and Indigenous groups), the Uluru statement expressed Indigenous peoples’ “aspirations for a fair and truthful relationship with the people of Australia”. 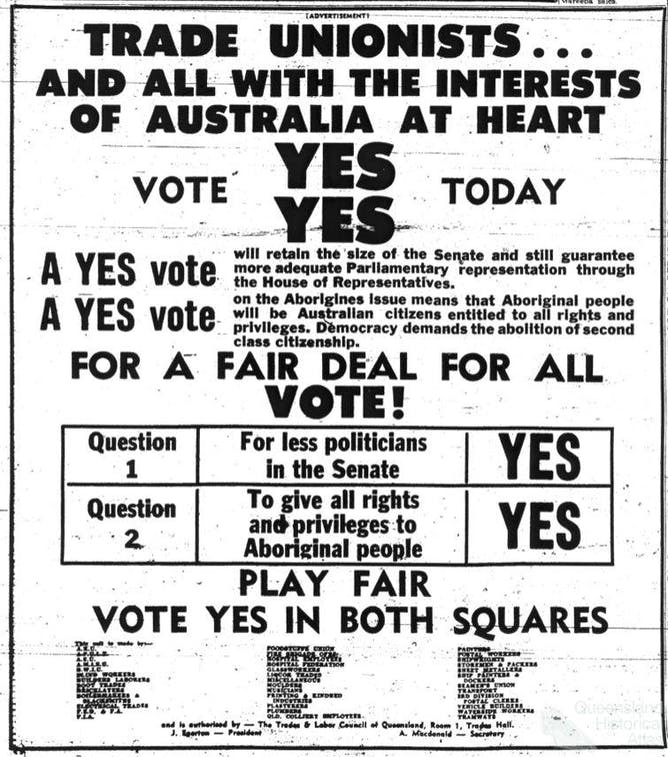 Yet, 50 years ago, 90% of Australians voted in favour of what they believed would be a “fair go for Aborigines” in supporting the amendment of two clauses within the Constitution. 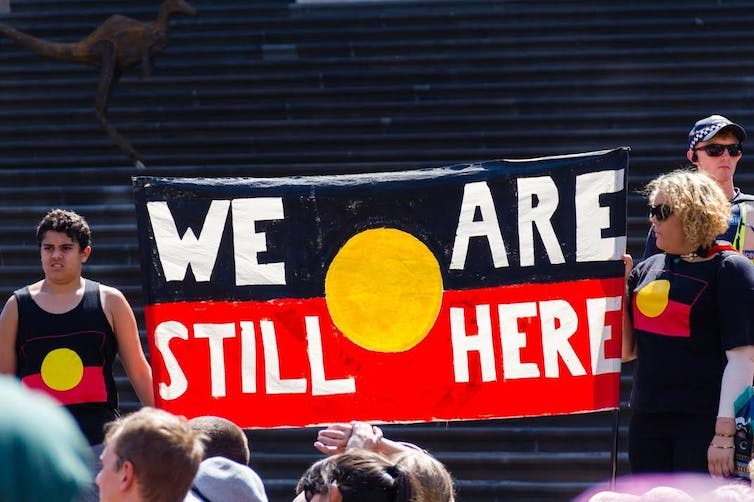 Fifty years on, there remain some uncomfortable truths about what those amendments did to improve the relationship between Indigenous and non-Indigenous Australia. Bain Attwood and Andrew Markus have argued that the “yes” vote did little to change the administration of Indigenous affairs; nor did it grant Indigenous peoples citizenship rights, voting rights or put an end to racial discrimination. 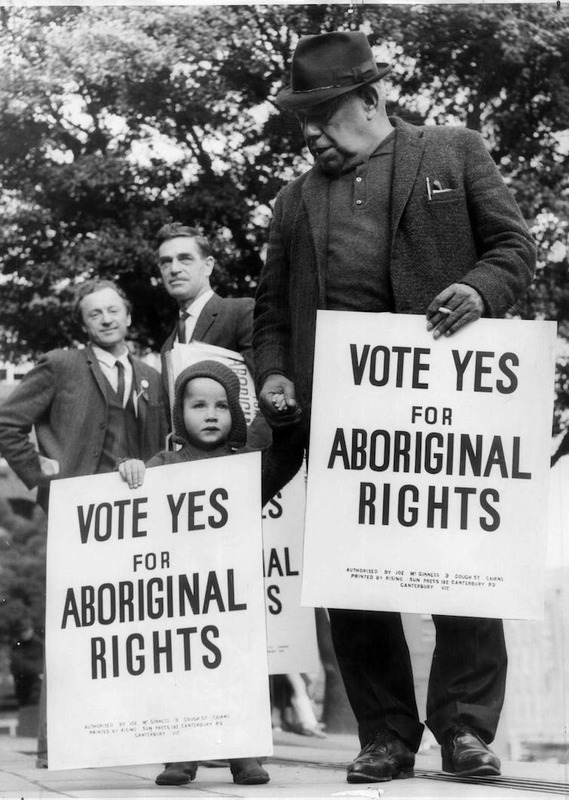 The constitutional amendments attended to what appeared to be racially discriminatory clauses, which excluded Aboriginal people. The result may well have made Australia appear less racist, but it did not address the inherently racist nature of the constitution. One example is the amendment to Section 51 (xxvi), referred to as the race power, which excluded Aboriginal people from the Commonwealth’s special powers to introduce laws affecting “the people of any race”. The original intent of this clause was to enable the Commonwealth to “regulate the affairs of the people of coloured or inferior races” in restricting immigration of non-white non-British populations. I do not think either that the doctrine of the equality of man was really ever intended to include racial equality. There is no racial equality. There is that basic inequality. These races are, in comparison with white races — I think no one wants convincing of this fact — unequal and inferior. Campaigning on the 1967 referendum. It is hard to imagine how our inclusion as a raced people within this racially discriminatory clause would be emancipatory. In being raced, we were not just named – we were claimed. When the First Fleet arrived in 1788 on the land of the Gadigal people, it did not just bring convicts, marines, seamen and civil officers. It also brought with it “the Aborigine”, and our racialised construction as Aborigines has served the colonial project well. Being an Aborigine has circumscribed our being, our relationship to this place and to the state. In being raced, we have become known by the state and through our relationship with it. It has cemented a relationship of power over us, physically, morally, intellectually, politically and legislatively. Racism is not just echoed in the words of right-wing commentators or the jokes of professional football players; it is ingrained in our society, enshrined in our institutions and our legislation. Race is inescapable and it has been central to the colonial project. We cannot talk about building truthful relationships without being honest about the racialised realities of our social world. As a racialised subject, I have been subjected to lies dressed up as racialised truths that insist upon our inferiority. Every day, we are forced to contest these lies while having to live with them. In order to get by and get on in a social world that discounts us, we create for ourselves other lies. I remember the words of my father growing up, insisting that if I worked ten times harder than them, that I would “make it” – that it was possible to rise above my station, to rise above race. These were lies that we lived with in order to make the injustice of the world seem less insurmountable. But I cannot be blinded to the ways in which my presence is read racially, regardless of how hard-working I am, how articulate I might be or how acceptable my presence might appear. It does not inhibit the surveillance by police who perceive my presence as a predisposition to an unknown criminal act. It does not inhibit a rendering of me as an Aboriginal mother or my husband as an Aboriginal father being deemed at risk of not being able to look after my children properly. It does not prevent colleagues from seeing my presence as a scholar as an equity act, as an accommodation of my intellectual incapacity or as a cultural broker to white knowing. The lie I can no longer live with is the insistence that our racialised being can be remedied through our own efforts: that if we just acted better, if we just articulated ourselves better, that if we were recognised better, that our lives would be better. I don’t know if we can overcome race completely, but I do know that we cannot minimise the power of race by ignoring the power of race. Race was the foundation on which this nation was built and it continues to structure our society, its institutions and social life. We cannot build a better nation by simply piling new bricks or new clauses to cement over the reality of race and the way it manifests interpersonally and institutionally. While it was a remarkable feat that, 50 years ago, 90% of Australians supported in principle the idea of a fair go for Aborigines, we cannot get too swept away with the idea that the attending to the power of race is unfinished, or that it is confined to a constitutional clause or two. At every turn, conversations about race are downplayed, dismissed or booed into submission. It would appear that more effort in this country is spent on not looking racist than on not being racist. The danger of the next step (in whatever direction that might be) is that we will fail to tell the truth about race. We can only hope that the federal government and the Australian people will heed Indigenous peoples’ call for a “fair and truthful relationship” through a fair and truthful conversation about the power of race in maintaining power over Indigenous peoples’ lives and lands. This essay is an excerpt from Chelsea Bond’s keynote address at the State Library of Queensland’s 50 Years and Counting event.